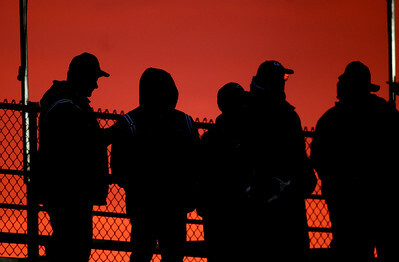 Mike Greene - mgreene@shawmedia.com Fans wait for the start of a game featuring Cary-Grove versus Jacobs Friday, September 21, 2012 at Cary-Grove High School. Cary-Grove (5-0) defeated Jacobs (3-2) 45-14 to remain undefeated. 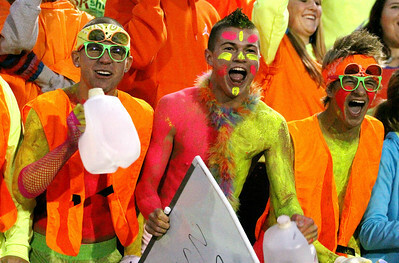 Mike Greene - mgreene@shawmedia.com Cary-Grove students cheer before the start of a game against Jacobs Friday, September 21, 2012 at Cary-Grove High School. 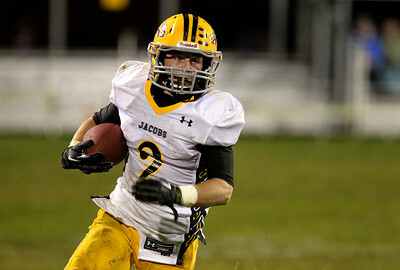 Cary-Grove (5-0) defeated Jacobs (3-2) 45-14 to remain undefeated. Mike Greene - mgreene@shawmedia.com Cary-Grove running back Kyle Norberg runs past Jacobs defenders en route to a touchdown during the first quarter of a game Friday, September 21, 2012 at Cary-Grove High School. 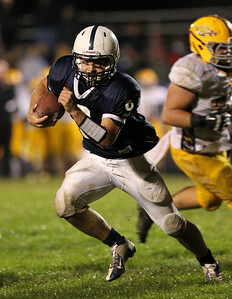 Norberg tallied 273 yards and 3 touchdowns, helping Cary-Grove (5-0) defeat Jacobs (3-2) 45-14 to remain undefeated. Mike Greene - mgreene@shawmedia.com Jacobs quarterback Bret Mooney drops back for a pass as rain falls during the first quarter of a game against Cary-Grove Friday, September 21, 2012 at Cary-Grove High School. Cary-Grove (5-0) defeated Jacobs (3-2) 45-14 to remain undefeated. 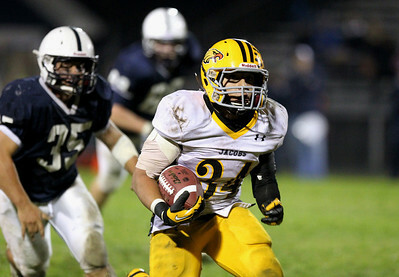 Mike Greene - mgreene@shawmedia.com Jacobs running back Steven Varela looks for space to run after catching a ball out of the backfield on fourth down during the first quarter of a game against Cary-Grove Friday, September 21, 2012 at Cary-Grove High School. Cary-Grove (5-0) defeated Jacobs (3-2) 45-14 to remain undefeated. 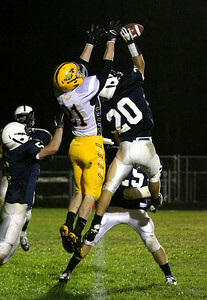 Mike Greene - mgreene@shawmedia.com Jacobs wide receiver Hunter Williams jumps to grab a pass as Cary-Grove defensive back Ryan Dundon turns to defend during the first quarter of a game Friday, September 21, 2012 at Cary-Grove High School. Cary-Grove (5-0) defeated Jacobs (3-2) 45-14 to remain undefeated. Mike Greene - mgreene@shawmedia.com Cary-Grove defensive back Matt Sutherland (right) swats away a pass intended for Jacobs wide receiver Jake Gierlak during the second quarter of a game Friday, September 21, 2012 at Cary-Grove High School. Cary-Grove (5-0) defeated Jacobs (3-2) 45-14 to remain undefeated. Mike Greene - mgreene@shawmedia.com Cary-Grove's Zach Marszal runs in the open after receiving an end-around during the second quarter of a game against Jacobs Friday, September 21, 2012 at Cary-Grove High School. 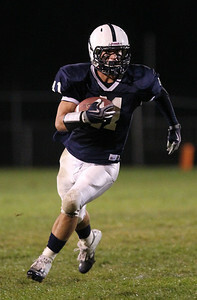 Marszal scored a touchdown on the play, helping Cary-Grove (5-0) defeat Jacobs (3-2) 45-14 to remain undefeated. Mike Greene - mgreene@shawmedia.com Members of the Cary-Grove marching band watch as Cary-Grove quarterback Quinn Baker scores a touchdown during the second quarter of a game against Jacobs Friday, September 21, 2012 at Cary-Grove High School. Cary-Grove (5-0) defeated Jacobs (3-2) 45-14 to remain undefeated. Mike Greene - mgreene@shawmedia.com Cary-Grove running back Kasey Fields runs past Jacobs defensive back Sean McAvoy during the second quarter of a game Friday, September 21, 2012 at Cary-Grove High School. Cary-Grove (5-0) defeated Jacobs (3-2) 45-14 to remain undefeated. Mike Greene - mgreene@shawmedia.com Cary-Grove quarterback Quinn Baker is hit by Jacobs defensive lineman Tim Regan while rushing during the second quarter of a game Friday, September 21, 2012 at Cary-Grove High School. 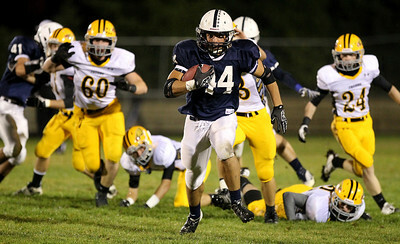 Cary-Grove (5-0) defeated Jacobs (3-2) 45-14 to remain undefeated. Mike Greene - mgreene@shawmedia.com Cary-Grove running back Kaene Connington runs behind a block by teammate Kasey Fields on Jacobs defensive back Sean McAvoy during the second quarter of a game Friday, September 21, 2012 at Cary-Grove High School. Cary-Grove (5-0) defeated Jacobs (3-2) 45-14 to remain undefeated. 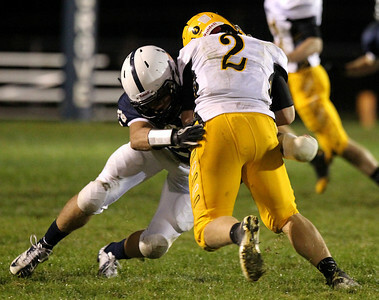 Mike Greene - mgreene@shawmedia.com Cary-Grove defensive back Jakub Ksiazek puts a hard hit on Jacobs running back Greg Sidor during the second quarter of a game Friday, September 21, 2012 at Cary-Grove High School. Cary-Grove (5-0) defeated Jacobs (3-2) 45-14 to remain undefeated. 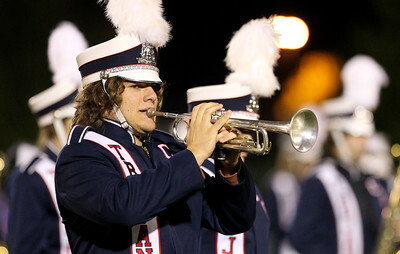 Mike Greene - mgreene@shawmedia.com Members of the Cary-Grove marching band perform during halftime of a game against Jacobs Friday, September 21, 2012 at Cary-Grove High School. Cary-Grove (5-0) defeated Jacobs (3-2) 45-14 to remain undefeated. Mike Greene - mgreene@shawmedia.com A member of the Cary-Grove color guard performs during halftime of a game against Jacobs Friday, September 21, 2012 at Cary-Grove High School. Cary-Grove (5-0) defeated Jacobs (3-2) 45-14 to remain undefeated. Mike Greene - mgreene@shawmedia.com Members of the Cary-Grove poms look into the stands after performing during halftime of a game against Jacobs Friday, September 21, 2012 at Cary-Grove High School. Cary-Grove (5-0) defeated Jacobs (3-2) 45-14 to remain undefeated. Mike Greene - mgreene@shawmedia.com Cary-Grove quarterback Quinn Baker runs during the third quarter of a game against Jacobs Friday, September 21, 2012 at Cary-Grove High School. Cary-Grove (5-0) defeated Jacobs (3-2) 45-14 to remain undefeated. Mike Greene - mgreene@shawmedia.com Jacobs running back Greg Sidor looks for running room after a reception during the third quarter of a game against Cary-Grove Friday, September 21, 2012 at Cary-Grove High School. Cary-Grove (5-0) defeated Jacobs (3-2) 45-14 to remain undefeated. 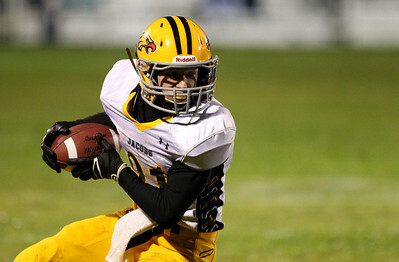 Mike Greene - mgreene@shawmedia.com Jacobs wide receiver Matt Fahey turns after makeing a reception during the third quarter of a game against Cary-Grove Friday, September 21, 2012 at Cary-Grove High School. Cary-Grove (5-0) defeated Jacobs (3-2) 45-14 to remain undefeated. Mike Greene - mgreene@shawmedia.com Jacobs running back Steven Varela looks for running room while being chased by Cary-Grove linebacker Patrick O'Malley during the third quarter of a game Friday, September 21, 2012 at Cary-Grove High School. Cary-Grove (5-0) defeated Jacobs (3-2) 45-14 to remain undefeated. Mike Greene - mgreene@shawmedia.com Cary-Grove quarterback Quinn Baker rushes during the third quarter of a game against Jacobs Friday, September 21, 2012 at Cary-Grove High School. Cary-Grove (5-0) defeated Jacobs (3-2) 45-14 to remain undefeated. Mike Greene - mgreene@shawmedia.com Cary-Grove running back Kyle Norberg puts his arm out to block Jacobs defensive back Josh Narvaez while running en route to a touchdown during the third quarter of a game Friday, September 21, 2012 at Cary-Grove High School. Norberg tallied 273 yards rushing with 3 touchdowns to help Cary-Grove (5-0) defeat Jacobs (3-2) 45-14 and remain undefeated. 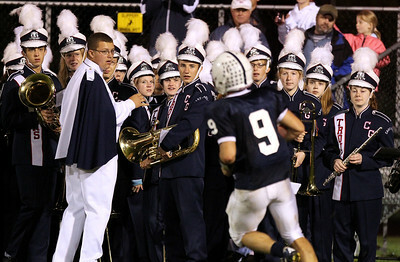 Members of the Cary-Grove marching band watch as Cary-Grove quarterback Quinn Baker scores a touchdown during the second quarter of a game against Jacobs Friday, September 21, 2012 at Cary-Grove High School. 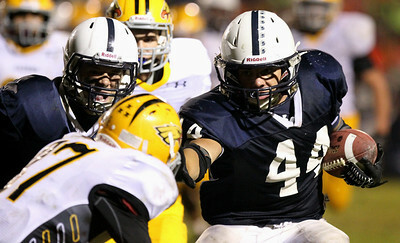 Cary-Grove (5-0) defeated Jacobs (3-2) 45-14 to remain undefeated.